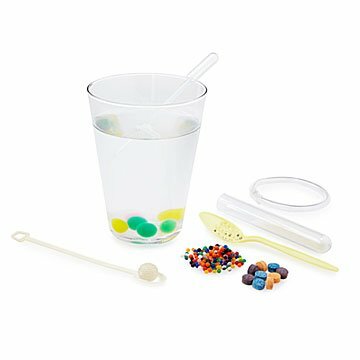 Tricks like the "vanishing beads" and "disappearing water," DIY projects like a water gel bracelet. Science: It's real… cool. For the kid who's always experimenting, tinkering, and asking "why?" this kit has your weekend covered. The theme: water gels. The fun: science tricks like the "vanishing beads" and "disappearing water," and DIY projects like a bracelet made of water gel. With more than a dozen activities, it's a great gift for imaginative young scientists, and adults who want to have their mind blown, too. Ages 8+. Made in China.